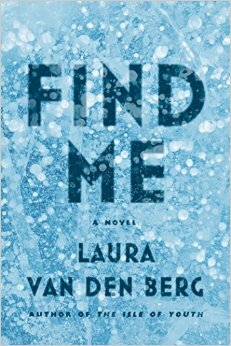 Laura van den Berg’s first novel (after two acclaimed short story collections), Find Me, will be published on February 17. It is one of the “buzz books” of early 2015 and has already received rave reviews from several key publications; van den Berg was interviewed about the book on NPR’s Weekend Edition with Scott Simon on February 14. For more background on Find Me, see my Winter 2015 Fiction Preview. A more detailed bio of van den Berg follows her essay. Writing a novel is not easy. Of course, I knew that going in—certainly when I began Find Me I did not think, “Hey, this should be easy!”—but as someone who had written only short stories, save for a few half-hearted 50-page stabs at novel writing, I did not appreciate how hard it would be until I was in deep. I wrote the first draft of Find Me in roughly six months, in 2008. I turned in my final edits to my publisher in May 2014. What was I doing with all that time in between? If you were to compare that very first draft of Find Me and the finished book, you’d be hard-pressed to find a single sentence that carried over from the initial version to the final one. In the six months I spent drafting Find Me, I worked in a frenzy, writing straight through, following every impulse as it occurred to me, no matter how misguided—just as I would when drafting a short story. The result? A hideous 300-page mess. It took me years—literally years—to understand what I had put on the page and why and what it might become, let alone what it should become. I’ve certainly had short stories that were hard to write, that took me years to write, but I’d never before felt so completely overwhelmed by a fictional landscape and its many possibilities and glaring flaws. And yet my heart was sunk into this story, and into the narrator, a young woman named Joy, and so on I went. The years that followed were a mix of trial and error. A few knots were successfully unfurled; others were pulled tighter; new ones appeared. I would spend six months or a year writing in one direction only to realize that direction was hopeless and that I needed to delete and begin anew. That was the hardest part for me: the lost time, existing in that unfinished state, with the uncertainty of knowing if I would ever finish and, if I did, what kind of book I would have on my hands. This process continued even after I was fortunate enough to sell Find Me and to get wonderful notes from my editor. On the one hand, I was so excited my book was going to be out in the world, but on the other I wanted to make sure what I put out into the world represented the absolute best I could do at that time. The novel has a two part structure—the first part is set in a hospital in rural Kansas; the second part is set on the road—and in the summer of 2013, I went to a writers’ colony in Key West feeling queasy about the second part. One of my biggest mistakes had been holding on to things that weren’t working for way too long, for not letting go sooner, and now I knew I was running out of time. “Write the book you want to read” became my line to myself. In Key West, it was brutally hot and I was plagued with insomnia and most days I would walk to the ocean to swim because that made me feel awake. One morning, in the water, I knew with uncommon certainty that I needed to cut the second part and start over. Totally. And so I did. When I left Key West, the version of Find Me I took with me was much closer to the final book, though some significant edits still lay in my future. I called all my missteps and detours “lost time” above, but I know that’s not really true, since all those detours played a part in getting me to where I needed to be, and I don’t think it would have been possible to skip over them. They were necessary, in their way. So I am grateful to this book. I learned a great deal from it. I am in the early stages of a new novel project now and I know that “write the book you want to read” is a good line to listen to. I know that if I get that queasy feeling I will hit “delete” and never look back. I know detours are necessary sometimes and that very few of the sentences I’m putting down now will remain and that I am in no particular rush. Laura van den Berg was raised in Florida and earned her M.F.A. at Emerson College. Her first collection of stories, What the World Will Look Like When All the Water Leaves Us (Dzanc Books, 2009), was a Barnes & Noble “Discover Great New Writers” selection and shortlisted for the Frank O’Connor International Short Story Award. Her stories have appeared in Conjunctions, The Kenyon Review, American Short Fiction, Ploughshares, Glimmer Train, and One Story, and have been anthologized in The Best American Short Stories, The Best American Mystery Stories, The O. Henry Prize Stories, The Best American Nonrequired Reading, and the Pushcart Prize XXIV. Her second collection of stories, The Isle of Youth, was published by Farrar, Straus & Giroux in November 2013. The Isle of Youth was named a “Best Book of 2013″ by over a dozen outlets, including NPR, The Boston Globe, and O, The Oprah Magazine; it was a finalist for the Frank O’Connor Award, and received both The Rosenthal Family Foundation Award from the American Academy of Arts & Letters and The Bard Fiction Prize. Her first novel, Find Me, will be published by FSG on February 17. She lives in the Boston area. Great to hear about her process!